Action sequences will be diminished when reduced to TV size, and the rest of the movie is laughably overwrought drama and generic action movie filler. How did John Woo turn so quickly from the action movie almighty into a self-perpetuating cliché? Once upon a time, the Hong Kong director of such guns-blazing genre high marks as "Hard Boiled" and "The Killer" (in Hollywood he's made "Broken Arrow" and "Face/Off") went to amazing lengths to create shoot-outs and fight sequences that were as precise, poetic and visually striking as a ballet. Once upon a time, if John Woo had two enemies race toward each other on motorcycles, then jump off the bikes and collide in mid-air, it would have seemed like the coolest fight scene intro ever. 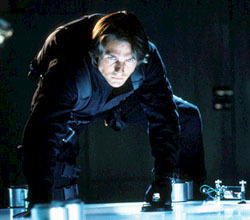 But somehow in "M:I-2" (the "official" title for "Mission: Impossible 2"), the director manages to make just such a sequence look 1) boring, and 2) like it was choreographed by a professional wrestler who had just seen "The Matrix." Woo takes soooo long setting up this clash -- with close-ups of a shaggy Tom Cruise scowling with Steven Seagal determination, close-ups of hands revving handlebar accelerators, slow-motion shots of squealing tires, multiple angle edits of the same 3 seconds of racing footage slowed down so much it takes 60 seconds to get through -- that by the time Cruise and rogue spy Dougray Scott ("Ever After") actually fly through the air at each other, you've anticipated the entire sequence and there's nothing left to enjoy about it. Yeah, yeah. Very cool. Get on with it. It turns out Newton is the bad guy's ex, so after falling for her, Cruise is forced by his boss (Anthony Hopkins, wasted in a cameo) to send her into the enemy's camp, a breathtaking Australian beach house, to seduce what information she can from Scott before his henchmen convince him she's jeopardous. Smitten with the girl, Cruise has reservations and regrets. Newton is angry at him for not leveling with her earlier. Cruise gets jealous watching her (through a spy satellite) come on to Scott (a serious fashion victim in unfortunate, pimp-in-the-'70s denim suits). Parachuting off a skyscraper after being out-gunned in the picture's only truly exciting firefight, Cruise actually pauses and says to Newton -- being held captive and infected with the virus -- "Stay alive! I don't want to lose you!" like he's Daniel Day Lewis in "Last of the Mohicans." What Woo doesn't seem to realize is that nobody cares about this unintentionally comical love story. It inspires snickers, which turn to outright guffaws when flirting scenes are combined with action sequences -- like when Cruise and Newton stare seductively at each other as their cars spin out in tandem during a chase on a winding mountain road -- in slow-motion, of course. Tom Cruise is no James Bond. He also seems to have left his talent in his other pants. In this movie he has only two facial expressions: Grin and growl. Newton, who is very talented, isn't given much to do besides being pretty and seductive (granted, she's great at that!). Poor Ving Rhames, reviving his support team role from "M:I-1," is badly underutilized, reduced to desperately hollering "Do you copy!?" into walkie-talkies while holed up in the backs of surveillance vans. "M:I-2" has its moments. The first part of the motorcycle showdown is an incredible feat of stunt work, what with its front-wheel wheelies and its one-hand-steering, one-hand-shooting, 360-degree skids. But with the exception of a perilous rock-climbing sequence during the opening titles (you've seen it in the ads), every bit of eye-popping excitement the movie serves up is badly diluted by Woo's lengthy, soporific lead-ins. A "Mission: Impossible" movie directed by John Woo sure seemed like a can't-fail proposition, but this flick has little intrigue to tie it to its namesake and it comes off more like a very expensive John Woo spoof (doves flying around during a shootout again?!?) than an actual John Woo film. There's lots to look at, but very little worth seeing.